The beautiful Tamar Valley river. A taste of what Cornwall has to offer. We would love to welcome you to the Drakewalls House in Gunnislake Cornwall. 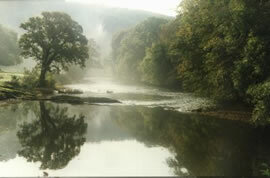 We are situated just over the beautiful Tamar river that divides Cornwall and Devon. Situated in the picturesque village of Gunnislake, a short drive from the historic and beautiful town of Tavistock. Drakewalls House offers the perfect base to take in all of the many sites in and around Cornwall and Devon.There is much to see and much to do in and around the area so please visit our 'Local Site's' page and 'Local Activities' Page. We take great pride in providing top quality food, service and accommodation that we hope will bring you back to our beautiful part of Cornwall again and again. We source many of our products locally, from high quality suppliers to ensure that the range and quality of the food we serve is the very best available. We are pleased to provide a full English breakfast with choices and variations to please everyone's taste. We do understand that not everyone's idea of a full English breakfast is the same so when booking please state the choices you require so that we can meet your needs. We also cater to the needs of children of all ages and we supply special needs diet breakfasts. Please state this when booking as it will make our job of taking care of you easier. Please feel free to navigate thought our website and check out all our rates, rooms, facilities and sites..